A complete tour package begins with your arrival in Jammu some 50 kms from Katra the base of your tour.The Vaishno Devi temple is recognized as one of the "Shakti Peeths" of goddess ' Durga'.This holy shrine of Mata Vaishno Devi which is situated in the folds of mighty 'Tirkuta' Hills' attracts lakhs of devotees from all parts of India and abroad. 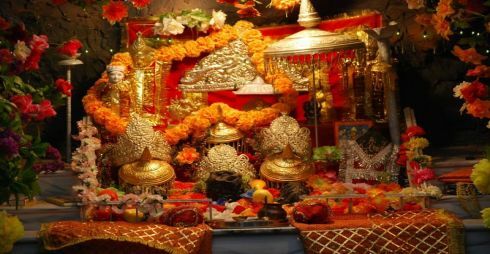 Located at 14 kms from Katra Yatris has to trek then they are blessed with the Darshans of the Mother Goddess inside the Sanctum Sanctorum- the Holy Cave. Darshan is opened round the clock throughout the year. The scenic beauty, the landscape around and the constant chanting of 'Jai Mata Di', leaves a mystic effect on the devotees. At the culmination of their pilgrimage the devotees are blessed with the 'Darshans' of the deity in her three manifestations as three Pindies, located inside the sanctum- sanatorium. It is truly a spiritually uplifting experience to witness the faith of the devotees, who are motivated to the heart by three words being chanted since the ages. On your arrival at the airport or railway station. You will be receive by our representative who will be accompanying to Katra Hotel. Check in at hotel. Overnight at hotel. After breakfast begin your climbing or can take Doli or Horse from there towards the Shrine (Helicopters tickets will be provided to the willing customers against a payment as decided by the State Government). Return to the hotel. Overnight at Hotel. After breakfast leave Katra and Drive to Patnitop. Stay at Patnitop and enjoy the nature. Overnight at Hotel. After your Breakfast Morning free for personal activities, transfer in time for your onwards Journey. Do's and Don'ts of this Yatra. · Approach the registration counter to obtain the Yatra slip upon reaching Katra and especially while you are at trekking to enter into the temple. · If you forget obtaining Yatra slip then it is impossible to cross beyond the Ban Ganga check post. · Obtain Vaishno Devi Yatra Information room reservation details prior to starting Vaishno Devi Yatra by different means for which enquiry and reservation counters at Katra, Bhawan and other locations from Sanjhichhat and Adkuwari facilitate such services. · Do confirm rates of Palanquins, Ponies and Porters in advance which is crucial for hassle free pilgrimage. The Vaishno Devi Yatra Rule strictly followed is that they shouldn’t be paid extra than genuine rates as applicable. · Note the valuable Vaishno Devi Yatra information that facilities for drinking water, blanket and food are supplied free of cost hence it is better to leave the unnecessary items at Katra itself. · Obtain Yatra slip to get into queue once reach Bhawan from the check post. · Wait for the announcement of your group number to start the Darshan process. · Wash yourself fully especially by cleaning your cloths prior to starting Darshan. · Go to the main waiting hall to deposit coconut for which taking token is a must. · Keep rest items in the cloakroom except cash and offerings. · Ensure visiting Bhairon temple at the last stage as Darshans at the Holy Cave is prime. · Don’t keep any electronic item including mobile camera, video camera and other such items in the track that are not allowed. · Avoid vulgar dressing, luggage or gestures and talk that depict vulgarity. It is an important rule for Vaishno Devi Yatra and must be maintained strictly top maintain the holiness of this journey. · Make sure you don’t do any sort of outing, picnic or photography during this pilgrimage which is an important rule of the tour. · Do understand the sentiments of co-pilgrims while in the Vaishno Devi Yatra and so should you maintain thorough cooperation for best possible security. · Avoid resting in the land slide prone areas while moving ahead till the temple premises. · Reduce the use of plastic and make use of dustbins so should you maintain cleanliness. · It is necessary to avoid valuables in trek, so is important keeping aloof from strangers. Do note that maintaining clean environment or strict no use of tobacco and suppressing begging are best and highly appreciable. · The pilgrims preferring pony journey must take the old route. The new route doesn’t permit pony hence pilgrims with medical problems should rather avoid the new route. · Chanting or spelling slogans inside the cave is strictly prohibited. · Offering dakshina or tip to anybody especially temple employees is highly discouraged.